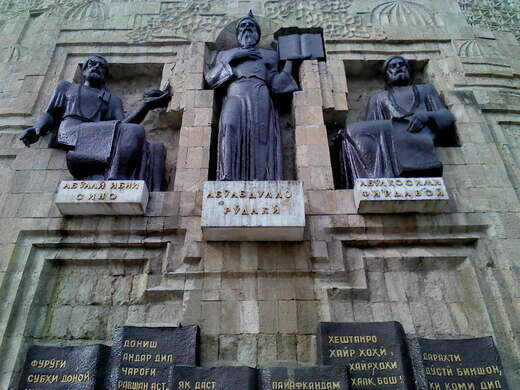 A building facade covered with the statues of 11 giants of Tajik literature. If you thought that all there was to Tajik literature was the famous Persian poet Rudaki, perhaps you might want to visit the Wall of Great Tajik Writers. The largest dam in the world and the site of a potential disaster. The world's second-tallest flagpole stands proud despite dropping rank. This dark, damp, perilous tunnel is the only passage from north to south Tajikistan. The “Wall” is the facade of the Writers’ Union building in Dushanbe, home to an association of novelists, poets, playwrights, and other writers. 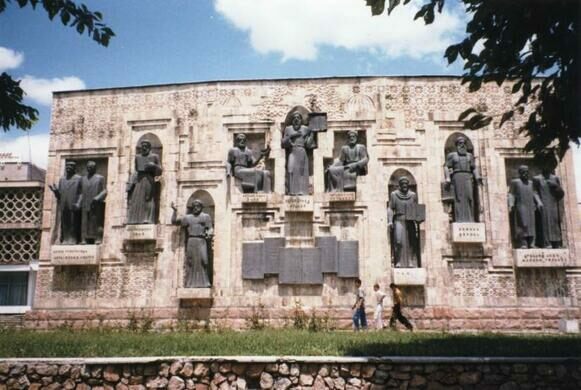 The large wall is carved with nine niches containing eleven life-size statues of famous Tajik writers, a tribute to Tajikistan’s Persian and Soviet history. The 8th-century “Adam of Poets,” Rudaki, justifiably takes the centre stage. He is considered a father of classical Persian literature, though sadly only a small portion of his work has survived the test of time. Other notable writers on the wall include poet Ferdowsi (940-1020); poet, mathematician and astronomer Omar Khayyam (1048-1131); writer and intellectual Sadriddin Ayni (1878-1954); and poet Mirzo Tursunzoda (1911-1977). In the garden next to the building is a large statue of Ayni and famous Soviet writer Maxim Gorky sitting around a table, absorbed in conversation. The Writers’ Union building was designed by renowned architect E. Salikhov and constructed in the early 1980s. The structure immediately became an exemplary manifestation of Soviet Modernist architecture, a trend that incorporated local sensibilities within the Soviet architectural tradition, which emphasized social purposefulness, grandiosity (regarding size), and frugality (regarding construction materials). All these features are clearly seen in Salikhov’s creation in Dushanbe. The Writers’ Union dates back to the Soviet era, when all literary organizations were absorbed into a union supervised by the government. The objective was to ensure that contemporary and older literary work for public consumption would not contravene Communist ideals. Nowadays, the organization’s goals resemble those of writers’ unions in most any other country. The Writers’ Union Building is located in the center of the city, next to the National Museum of Tajikistan, Rudaki Park (another tribute to the famous poet), the Dushanbe Flag Pole, and many other attractions in the capital. The first version of this stalwart construction appeared around 3,000 years ago. The remains of an ancient city-state along the Silk Road. The oldest cafe in Montevideo preserves its history as the city's bohemian hub. Dozens of striking Indian symbols cover the second-floor hallways of this rural courthouse. This medieval sanctuary's tree-framed door looks like a portal to a mythical realm. This beautiful example of neoclassical architecture is one of Uruguay's most treasured cultural gems.